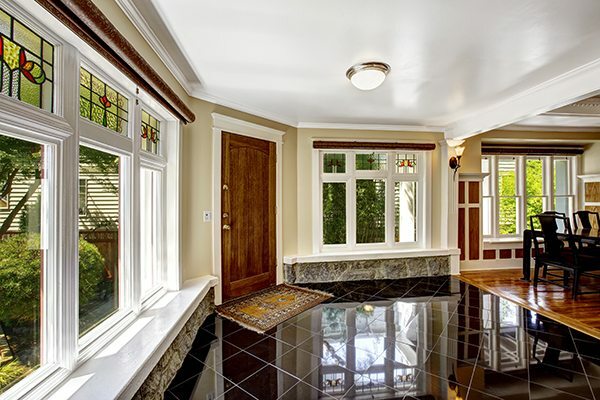 Your windows add beauty to your home, but not without interior trim. Without it, you would see the rough cut gaps between the drywall and the window, not to mention construction debris or portions of insulation. If looking to obtain a window installation, you should replace the old trim. Trim is available in many materials, such as oak, pine, composite, vinyl, MDF (medium density fiber), and tons of other materials. Oak add strength while also adding durability and beautiful wood grain. Pine is a less expensive option over oak and is very common. Composite is made of recycled materials which results in a material that kind of looks like plastic, but is not. This material cleans easier and is quite durable too. Vinyl also adds durability, but can warp if exposed to high levels of heat or is installed improperly. MDF is a highly affordable solution that has the feel of wood, but is made of wood fibers so it is often primed and ready to paint. In addition to materials, design and finish play a big role. Design can be anything from beveled trim to patterned trim with circles, squares, wavy lines, etc. Finish can be one of any three categories, which includes finished trim, primed trim, and unfinished trim. Finished trim will be stained or painted. Primed trim is ready to paint. Unfinished trim can be painter or stained. When it comes to sizes, you will find many variations. Choose from anything like 2 inches to 4 inches for window casings or trim. Your need for size may depend on what you are replacing too. In fact, if there is damage further out from the old trim, you can purchase wider trim to conceal it. In summary, understanding the options and details with window trim will give you more buying power and more of a chance to get what you truly need. Just don’t forget the nails.